Sign number 17 that I’m getting old? Spring means I get excited about fairing and sanding. While spring in Montreal started off with some promise the past couple of weeks have been cool and damp. Nevertheless, I’m anxious to get back to work on the VG23 in the hayloft and preparations have begun (tonight’s forecast of snow regardless). This afternoon I thought I’d take a crack at revamping the Flash Player photo gallery I’ve been using to share photos of the construction. For awhile there I was “documenting” the project with an old 35mm film camera so during this winter’s Christmas holidays I spent a long night with some Red Label and a scanner. The result being a bunch of dark, pixelated digital images and a hangover. See if you can spot the point where I entered the world of digital photography. i need help on building a boat for a science project. 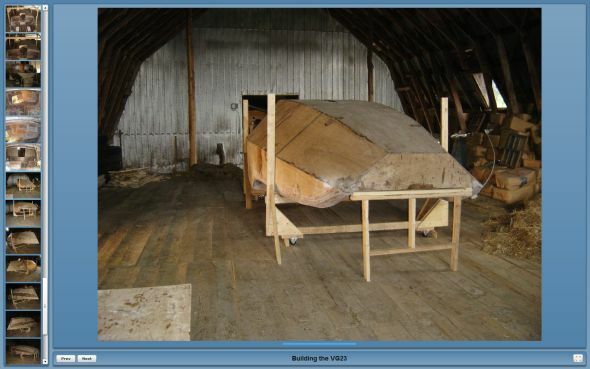 I have been studying my VG23 plans for about 2 years now, and I am about ready to start. Looking at your sight has realy given me some confidence. You make it look easy. Yours looks GREAT. Keep poasting for those of us who are following in your footsteps. It would be great to hear about your progress as your build comes together. It is so much fun to watch that hull get built.